1) Is a cargo bike difficult to ride? 2) Is a cargo bike difficult to ride with a load in the box? 3) How much weight can a cargo bike carry? 4) Is a cargo bike able to climb hills? 5) How does the cargo bike’s steering work? 6) Is a two-wheeled cargo bicycle as stable as a cargo tricycle? 7) How safe is my child on a cargo bike? 8) Is my child as safe on a cargo bike as in a conventional child bike seat? 9) Is my child as safe on a cargo bike as in a bike trailer? 10) Where are Cargo Cycles cargo bikes made? Are they Bakfiets.nl Cargo bikes? 12) How do I use hub gears? 13) Where is Cargocycles’ shop? 14) What hours are you open for business? 15) Is Cargocycles looking for dealers? 16) How much beer can a cargo bike carry? 17a) Why are your cargo bikes so expensive? 17b) Why are your cargo bikes so cheap? Not at all. A cargo bike rides very much like a normal bike. The steering mechanism is carefully designed to ensure this. A tip for new riders – the front wheel can be very distracting. Don’t watch it, look ahead to where you are going. “Serious” cyclists generally have no trouble riding a cargo bike, but claim that it will “take some getting used to”. People who ride less often (or who haven’t ridden in years) tend to find the cargo bike as easy to ride as any other bike. The bike certainly gets heavier, but if anything the steering and balance are more stable. Because the box is so low to the ground, adding a load doesn’t make the bike top-heavy like a typical luggage rack. The cargo bike is rated to carry a total of 150kg, including the rider. We’ve tested the cargo bike with 80kg in the cargo box, and a 90kg rider. That’s 22 house bricks, which mostly filled the cargo box. Almost anything else that can fit in the cargo box would be lighter than this. The bike coped with the load without real trouble: it was certainly strong enough, although the frame was starting to feel a little springy. It was not difficult to ride, and was quite easy to steer and control once accustomed to the handling characteristics of such a heavy bike. Carrying a load of this size is possible, but not recommended, and not covered by warranty. All bikes are easier to ride on flat land, and a cargo bike is no exception. Within reason, a cargo bike’s 8-speed gears allow it to be ridden up hills. It’s realistic to compare an 8-speed cargo bike with a 3-speed conventional bike. The cargo bike is heavier – especially with a couple of kids and some groceries on board – so it needs the additional low gears. A 3-speed bike can go a lot of places, but it’s not a mountain climber; the same can be said of a cargo bike. Choose a low gear and take your time. There’s a steering linkage from the base of the steering tube (below the handlebars) to the forks. With ball joints at each end, the steering is very direct, with no noticeable play or slack. 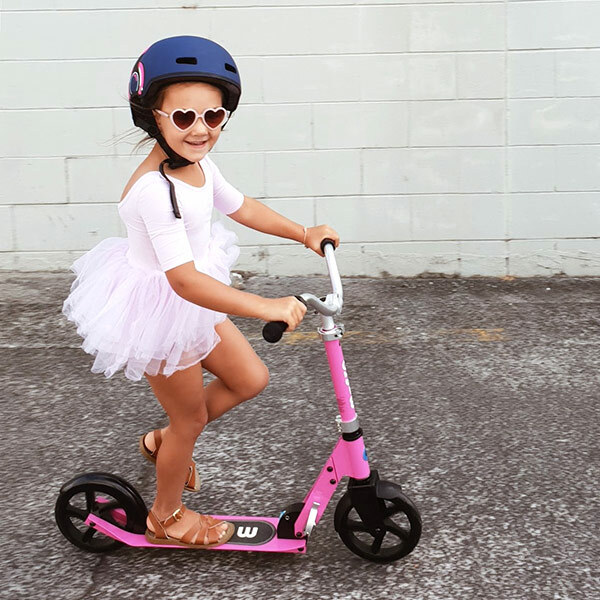 When standing still or riding slowly in a straight line, a tricycle is more stable. On real-world surfaces, cross-slopes and around corners, a bicycle is far superior. 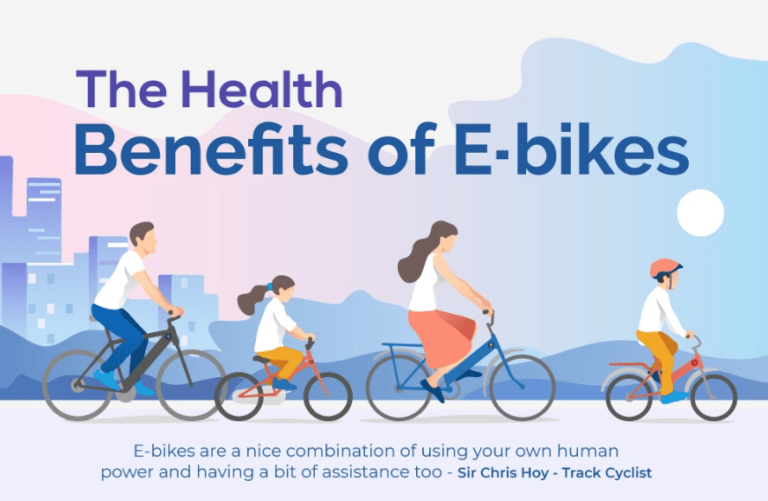 The benefit of a two-wheeled bike is that it can lean relative to the road; that means the bike can remain upright regardless of any angled road surface (camber), and can bank into corners. Like a conventional bike, a moving cargo bike has “dynamic stability” and is subconsciously balanced by steering. We have done no formal testing, so can only speculate as to the safety of a cargo bike. Choice has published an article comparing bike seats and trailers for carrying children. Some of the issues discussed are specific to rear-mounted child seats and trailers, and solved by the cargo bike. Other issues are universally applicable. A key benefit of the cargo bike is that your child (or any other cargo) is in front, in clear view of the rider. This is much safer, as well as giving your child a better view and allowing you to talk with her. You don’t need to look behind to check up on her, as you do with a rear rack-mounted seat or trailer. Cycling with children is an inherently risky activity. It is the responsibility of parents to ensure the safety of their own children. If in doubt, discuss with your child healthcare professional. Children should always wear an approved bike helmet when riding in a cargo bike. We have done no formal testing, so can only speculate as to the safety of each option. The child sits low in a cargo bike, making the bike more stable than a high mounted child seat on a conventional bike. In case of a crash, this also means the child doesn’t have so far to fall, and is protected by the sturdy plywood box. Balancing and securing a child in a conventional bike seat takes more than one set of hands. With the heavy duty four-point stand under the cargo box, a cargo bike is stable and can be loaded and unloaded single handed. We are yet to see any safe method for carrying more than one child on a conventional bike. The cargo bike has room (and safety harnesses) for two children, with cargo space to spare. It is possible – and quite common in Europe – to mount a child bike seat on the rear luggage rack of a cargo bike, for even more carrying capacity. Most child-carrying trailers have two wheels. Two-wheel trailers have been known to flip over when one wheel hits a bump or curb. The wheels of a two-wheel trailer will often hit bumps that the bike avoids, because the two trailer wheels are set wider than the wheels of a bike. Two-wheel trailers are also prone to rolling over if towed too fast around a corner, because the trailer doesn’t bank into the corner like the bike does. Obviously, none of these issues apply to a cargo bike, as the child is riding on the same two wheels as the adult cyclist. For even more carrying capacity, it is possible to tow a trailer behind a cargo bike. Care should be taken to avoid trailer roll-overs. 10) Where are Cargocycles cargo bikes made? Are they Bakfiets.nl Cargo bikes? Cargocycles cargo bikes are proudly made in China – the biggest cycling nation on earth, with considerable experience in building and using bikes to carry loads. Having the bikes built in China from quality components, we are able to supply them for a fraction of the price of the (brilliant but costly) Bakfiets.nl Cargobike. Derailleur gears have been most common on Australian bikes for at least 30 years. They are a good option for sporting and recreational bikes, because they are light, relatively cheap, and can provide a wide range of gear ratios. On a practical working bike such as a cargo bike, there are more important factors than weight and cost. Hub gears are much more robust, durable and reliable. By putting all the moving parts inside the wheel, hub gears offer a much better solution for working bikes. It’s almost impossible for the chain to fall off a hub geared bike. With a constant chain line, it’s possible to use a chain cover, keeping the bike’s greasy chain away from the rider’s clean trouser cuffs (and keeping grit and grime away from the bike’s drivetrain). A modern multi-speed hub requires little attention other than an annual service and adjustment. The main difference between hub gears and derailleur gears is that you don’t need to pedal – or even be moving – to shift hub gears. There’s no need to try to take off in a high gear, because you can shift to first before pushing off. It is good practice to pause pedalling to shift gears. There’s no need to pedal backwards, as was sometimes advised with older 3-speed hub gears. 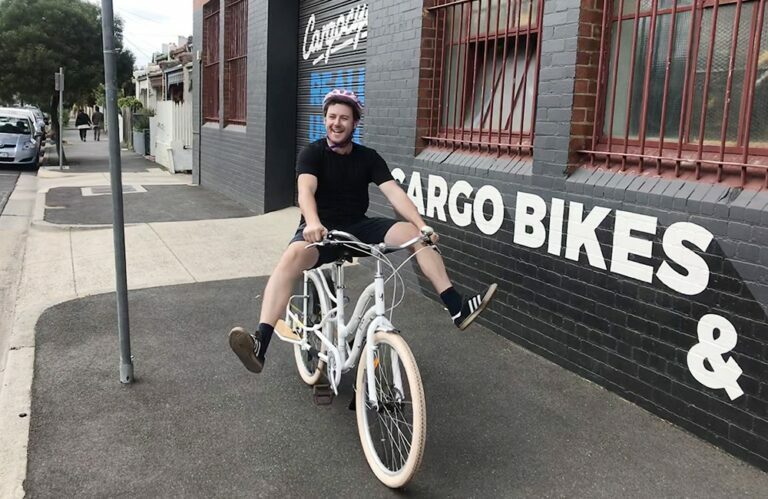 Cargocycles HQ is at 176 Lygon Street Brunswick East, Vic. If you run a shop and would like to stock Cargocycles bikes, please contact us to discuss wholesale pricing. Four cartons/cases/slabs of stubbies is easy. More would be possible if you drink cans, or if you load the cases higher, or if you use the rear luggage rack. We advise against riding cargo bikes under the influence of any intoxicating substance. We are asked both, and both are fair questions. Our cargo bikes are more expensive than a conventional bike of comparable quality. This is typical of unusual styles of bicycle. For example, It is a rule of thumb that a tandem bike costs twice as much as a comparable single bike. Likewise with cargo bikes. The economy of scale possible in the manufacture, freight and distribution of conventional bikes don’t apply when dealing with low volume niche products like cargo bikes. That said, our bikes are much cheaper than most other cargo bikes on the market. As a concept developed in Northern Europe, most cargo bikes are produced in Europe. As with other manufactured goods, European products carry a premium price. We avoid the “made in Europe” price tag by sourcing our bikes from China – where most of the world’s bikes are manufactured. We have been able to make the economy of scale work in our favour by making our bikes affordable. 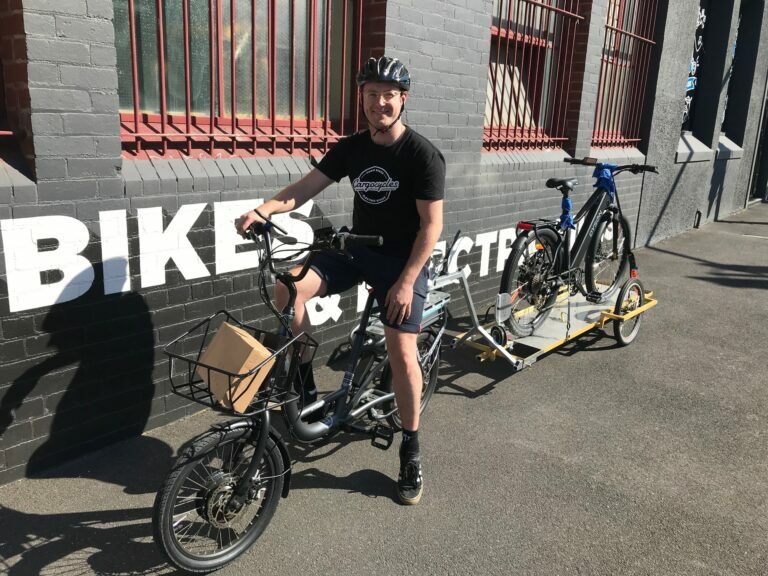 Our cargo bikes are built in larger production batches, and we import them by the container load – much cheaper than importing very small numbers of premium-priced cargo bikes. The cheaper our bikes, the more we are able to sell, reducing costs further – a virtuous cycle. We could make our cargo bikes a little cheaper by using lower priced components. Aside from the specialised frame, much of the cargo bike’s cost is in the Shimano drivetrain. 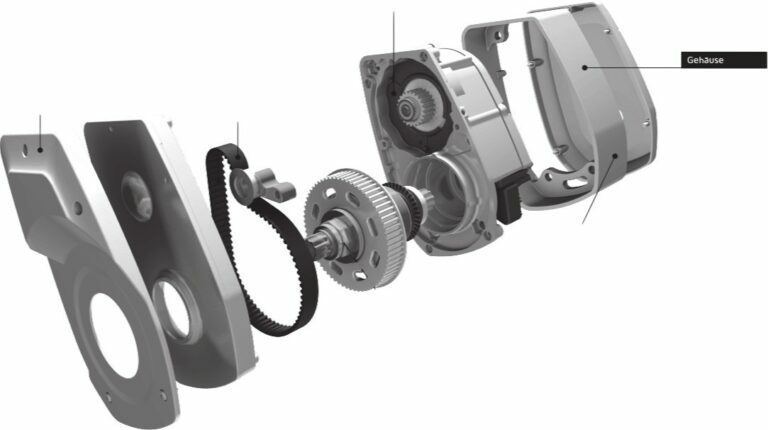 A no-name derailleur gear drivetrain would save a few dollars, at a cost of functionality. Conversely, we could make our cargo bikes a lot more expensive by using higher priced components elsewhere on the bike, without making a huge difference to performance or durability. We believe we have achieved a good balance of price and performance, to bring a very practical cargo bike to market at an affordable price. Feel free to contact us with any questions or comments about our cargo bikes.